The first exhibition of the new season for the Xtrematic team was the most energetic and successful. The international exhibition “Amusement Rides and Entertainment Equipment RAAPA EXPO – 2019” has been held in Moscow twice a year for over 10 years! Each season it brings together many manufacturers and sellers of entertainment equipment, arcade machines and various kinds of simulators, as well as thousands of visitors and experts in the industry. 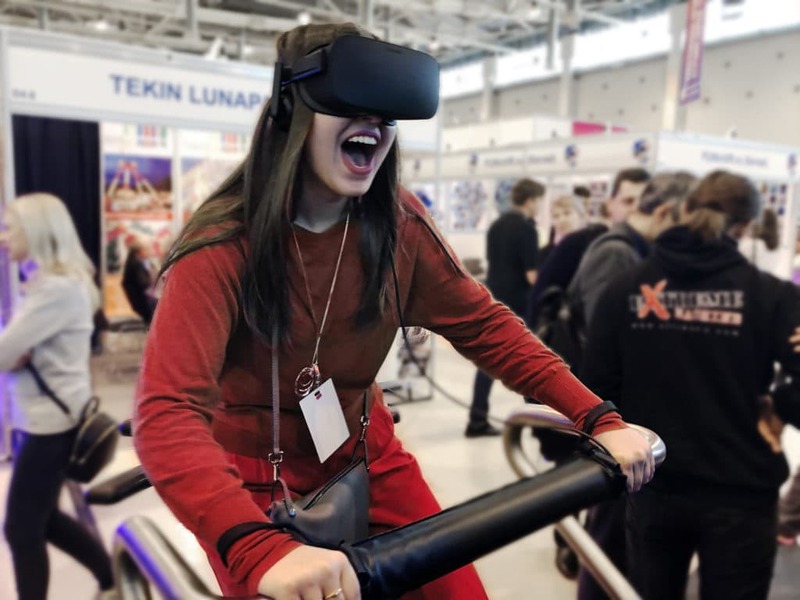 This year we focused on updating our library of content and brought to Moscow everyone’s favorite virtual reality simulator X-Machine with two new rides: Dune Race and Air Storm: Island of Freedom. It was exciting to watch the first lucky ones who tested our new ride Dune Race and shared their emotions with us. The endless hot desert, combined with the breathtaking racing and thirst for victory, delighted not only men, but girls who squeezed the maximum speed of their quad bike in pursuit of first place. Air Storm: Island of Freedom also impressed everyone who tried himself as a fearless pilot in the second part of the already familiar for everyone aviation shooter. This time, the danger for the players was not only dangerous fighters, but opponents who lurked on the boats, which are difficult to see, but the difficulties only kindle the excitement, aren’t they? We are happy that we can please our customers with the opportunity to spend a little time in virtual reality with their friend. The multiplayer mode allows you to experience the maximum emotions for any kind of racing, because competitions with a real rival immerse you even more into the virtual world and allow you to feel yourself alive, real. Thanks to everyone who came to our booth at the RAAPA exhibition in Moscow! We are glad to everyone who ride on our attraction and share their feelings. Your feedback is very important to you, because it is thanks to them that we can improve our product. The Xtrematic team is ready for a new trip and we will be happy to see you at DEAL 2019 in hot Dubai! For more information, contact our managers or leave a request on the site.